I’m so excited to share my first interview about the Holiday Heartbeats series! You’ll find it here with Scottish author Lacey Dearie on her popular blog Rock Paper Spirit Daily. Lacey is the prolific, author of cozy Cat Sleuth mysteries, and if you haven’t had a chance to get to know her, I suggest that you check out her award-winning blog (with over 35,600 subscribers!). She’s honest, insightful, and delightfully quirky with a keen business sense. It was a pleasure and an honor to have had this experience. Thank you, Lacey! 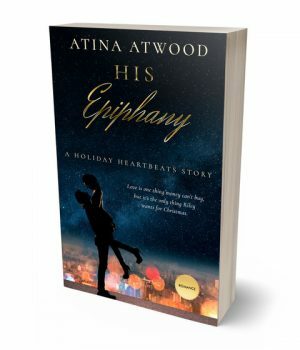 Today on Rock Paper Spirit, I’m welcoming romance writer, Atina Atwood, author of the Holiday Heartbeats series. She’s just released a new book called Love Games so I thought I’d invite her along on one of my research trips today. We’re at a masquerade ball, people watching and observing all the couples falling head over heels in love. Isn’t it sweet? 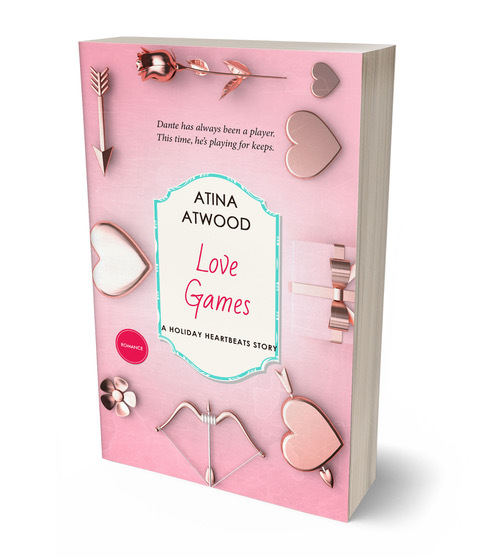 Love Games is available now! Atina, welcome to the blog! I love your mask! Thank you so much! I’m not necessarily one with off-the-runway fashion sense, but I’m really digging the whole midnight black, silver, and sparkling crystal thing going on here. Why don’t you tell me a little bit about your latest book? Love Games is a sweet Valentine’s Day novella, and it the second story in my Holiday Heartbeats series. This is Dante and Marisol’s story. Dante is a player, accustomed to using seduction in order to secure difficult business deals. He secretly despises himself for it and wants to change. When his method backfires, he takes some time to figure himself out. He ends up meeting Marisol, who doesn’t exactly embrace him with open arms. Marisol is a no-nonsense kind of woman, fresh out of law school and waiting for her bar results. She’s fiercely devoted to her Mamá and her best friend, and she’s just as protective of her heart. When they meet, sparks fly (as do a few tulips). Can Dante actually prove himself to be more than just eye-candy with a blemished reputation, or will Mari fall victim to the player’s game? The comment about the tulips is intriguing me, but I guess I’ll have to read the book to find out what that’s about! Isn’t this book 2 in the series? What was the first one about? Love Games (Holiday Heartbeats #2) takes place around Valentine’s Day. The first story in the series is His Epiphany, and it’s a sweet short story set during the Christmas season. Riley is actually Dante’s best friend; when Riley meets Epiphany, he knows he’s meant for her, but it nearly kills him when she runs into Dante’s arms. Years later, we find out why she ran to Dante instead of him. It’s a quick, sweet read. Maybe one day, I’ll revisit those two and learn more about their happily ever after. Imagine you’re a fairy tale character. Which one would you be and why? Presently, I’d be a dragon, because my Little Man (toddler) is totally into them. The more fierce, the better. Good choice! What one thing that is important to you would you give up if it meant you could become a better writer? I can actually answer this question in the past tense because it’s no longer hypothetical for me. Last year, I actually left my full-time university position to start my own business and be able to write full time. This is because I was put in a position that women face far too often — career or family. For me, family will always come first. I’d already been planning for a transition that would allow me more autonomy in my profession, but it takes guts, a bit of foolishness, and a ton of hope to walk away from what you know and also love. In the end, though, it has also helped me reclaim a deep sense of self-confidence. It isn’t easy, and I’m learning and growing every day. Waking up every morning with a strong sense of purpose and excitement is an amazing feeling. The best part is that I’m still affiliated with the university but on my own terms. It’s been one of the best decisions I’ve ever made, career-wise. I can definitely relate to having to choose between career and family! What are the hardest scenes for you to write? I often have difficulty writing the settings, because I’m so focused on what the characters are saying and doing. Sometimes, the background remains, well, in the background. I also have to be careful not to spend too much time describing any place because I’ll get so caught up in the details, and I’m in danger of missing some of the action between the characters. Like all of the stories in my Holiday Heartbeats series, Love Games takes place in San Diego, California. The characters travel all over the county, and I have to be careful not to include too many details or hard facts, but provide just enough information the reader draw a sketch in their mind’s eye of what I’m describing and then can focus on the action at hand. Masquerade balls: creepy or fun? Lacey, they are creepy AF. Don’t get me wrong — I absolutely love the bling on this gorgeous mask! It looks fabulous with black satin, Swarovski crystals all around the eyes, and the charcoal silk overlay is breathtaking. Of course, the raven’s feathers are to die for. Full disclosure — I’m taking this sucker home with me. But back to your question. Yeah, honestly, it seems as though everyone is parading around, wearing a mask. We’re trying too hard to impress when most of us can barely hold our crap together on a daily basis. Too often, we’re chasing illusions — whether it’s the mask of a political party or ideal, the idolatry of a celebrity, or the fanaticism of social media influencers. We’re losing sight of the fact that it’s okay to be a bit messy, a tad quirky, a little… lost sometimes. But if we keep focusing on the noise and shine surrounding us, eventually we’re going to collectively end up being a grotesque distortion of the superficial image we’ve been striving to become. Ultimately, we’re forgetting to be our true selves. Whatever the heck that means. Do your family support your career as a writer? Unequivocally. They also supported my career as an opera singer, which led to so many fantastic experiences, most importantly, meeting the love of my life while I was still a teenager. When I had to stop performing after a car accident, I turned to Academia, which inevitably led to research and a ton of writing. For me, it was a match made in heaven. Writing is a culmination of so many worlds. I don’t write Romance exclusively, but it’s definitely one of my most favorite genres to write. My husband is my biggest supporter, and my sister keeps asking me for more installments. I’d be remiss if I didn’t say that most of my closest friends are right in my corner as well. You’re extremely well-qualified in terms of academic achievements, aren’t you? Tell us a bit about your background before you became a writer. I’ve been on stage since I was five years old, so being in the creative and performing arts has always been an integral part of my life. The only thing that I’ve been doing longer than performing is reading. My mom loves to remind me that I started reading “books with no pictures” at the age of four. The multifaceted story of humanity has always fascinated me. My lifelong dedication to various methods of communication eventually led to me earning my Bachelor’s, Masters, Ph.D., and various certifications in interrelated fields. There’s something captivating about the Drang, or the urge to communicate by any means available to us. It doesn’t matter if it’s through music, through words, through language, through sounds, or through movement — some people just HAVE TO create — and I’m one of those people. I’m blessed that my family recognizes this and supports me in knowing that I simply must live my life as a creative spirit. What’s the most difficult part of the writing/publishing process for you? Is it the artistic side of things or the business side? I think that both sides have their pros and cons. I can see the artistic side being difficult for me because I’m still learning my craft. Despite its undeserved reputation, writing Romance is hard. I’m constantly learning by reading and writing. I ask questions: How much is cliché? How much is too much? Do the characters and plot have enough depth? If not, how can I enhance them? It’s a learning process, and from the very beginning, I decided that I was going to be honest with my followers about my journey into writing fiction. That means with each publication, I expect each one to improve. There will be hits and misses, and I expect to grow with each new release. I’m grateful and indebted to all of my readers and followers who choose to stick with me; Love & Light to those who encourage me every step of the way. Aww, look at that couple over there! He’s been smiling at her all night and he just worked up the courage to ask her to dance! Makes me all warm and fuzzy. What do you think brought you to the point where you started writing romance? Was it planned or was it something you stumbled upon by accident? I started reading Romance novels six years ago. I was bedridden for months and so I spent my days surrounded by things that brought me to a positive place emotionally. I discovered that there was nothing more powerful or healing than the expectation of a happy ending. Although I could say that writing Romance was something I stumbled upon, it wouldn’t be completely true. I’ve been researching the cultural necessity for Escapism and its employment through various mediums and genres throughout international societies and eras for years. One constant theme has always been Romance, unrequited or reciprocated. It’s a basic human theme — we all want to love and be loved. Most of the time the names just come to me, as do their stories. In Love Games, Dante and Marisol just introduced themselves to me with a funny scene involving tulips. Marisol quickly became Mari in my mind, and I can’t imagine her any other way. On the other hand, Mari’s best friend, Nhu, is the heroine in Luck of the Irish (Holiday Heartbeats #3 — coming soon!). Because Nhu is Vietnamese, I definitely knew that I had to do a lot of research on her name and understand the significance of her name from a cultural standpoint. Fortunately, I can also rely on some of my family members for #Ownvoices insight to help me with this. 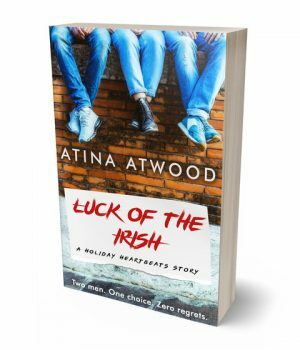 Luck of the Irish – coming soon! Oh no. That couple aren’t getting along so well any more. Did she just throw cake at him?! Um yes. She definitely did. If I didn’t know any better, I’d say the 5’3 culprit looks like Nhu, and Mari is trying to hold her back! And now Dante is protecting them both from… the duck confit. Darn it. I was looking forward to eating some of that. It’s turned into a full-on food fight. DUCK! Ok, before we go, because no Lacey interview is complete without this question, what’s your favourite cookie/biscuit? I love chocolate chip cookies. Soft in the center, and warm all around with just the slightest crisp around the edges. Yum! Thanks Atina. Where can we find Love Games and your other book, His Epiphany? And where can we find you on social media? Thanks so much, Lacey! This was fun. You can find Love Games, His Epiphany, Luck of the Irish (coming soon!) and all of the Holiday Heartbeats series on Amazon, iBooks, Barnes & Noble and wherever ebooks are sold. Join my newsletter for freebies and news about the series’ progress. Check out my blog for #MotivationalMondays, Tuesday’s blog, and Thursday’s Romantic Thought. I’m also on Twitter, supporting and following back other readers and writers who love to write and spill the tea. I also exist on Pinterest, Instagram, Goodreads, and Facebook. I’ve had a blast. Thanks again Lacey, and have a fabulous Valentine’s Day!